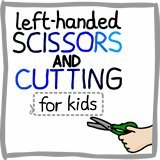 On this website you will find all the information and advice you'll need to help left-handed children from nursery right through their school days to overcome the annoyances and frustrations of living in a right-handed world. You'll find lots of ideas and resources specifically for left-handers, giving them the best techniques for adapting right-handed teaching and resources across the school curriculum. Armed with these techniques, left-handed children can learn new skills confidently and efficiently, without awkwardness or frustration, leaving them free to achieve their potential. 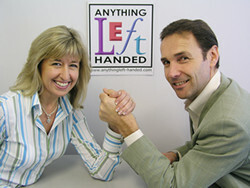 Have a look at the Anything Left Handed Blog to keep up to date with left-handed issues and product releases. This site has been created by Keith and Lauren Milsom, owners of Anything Left-Handed the famous website and London shop started in 1968. For the past 20 years, we have run the International Left-Handers Club, working to increase awareness of left-handers' needs. We are both left-handed and have a left-handed son and a right-handed daughter, so we covered all the angles! We are committed to improving teaching for our left-handed children in schools, not only in handwriting, but in other areas of the curriculum, where unnecessary hurdles and lack of guidance are hindering our children's progress, often leading to them developing awkward and inefficient habits, as they try to adapt to right-handed tools and positioning. How do we know what we are talking about? The Left-Handers Club now has over 100,000 members spread all round the world and over the years we have received many thousands of requests for help and advice. We have also been running an ongoing "left-handedness" survey for more than 15 years and, more recently, our survey on left-handers school experiences. With this huge amount of information and practical experience and over 30 years history of sourcing and developing left-handed products, we are probably the world's leading experts on all the practical issues related to left-handers and left-handed children in particular. We hope that through this site we can help you and your family in some small way. 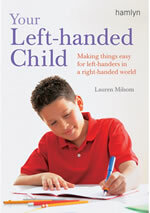 Lauren Milsom's definitive guide to left-handed children and how you can help them. 128 pages in full colour. Essential reading for any parent or teacher of a left-handed child, this book is a practical and comprehensive guide to the challenges your left-handed child may encounter from their first years right through school life and beyond and how you can help them. Are left-handed children at a disadvantage? There is absolutely no reason why your left-handed child should be at any disadvantage at school or home, Indeed, it is very common for left-handers to excel in many subjects, including sport and art. All they require is the correct guidance, relevant to a left-hander, and where necessary, the correct equipment, when learning a new skill. 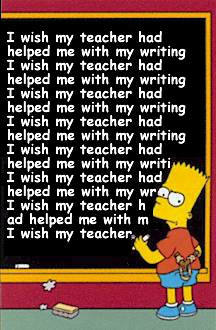 For example, with handwriting, you will see from this site that the techniques for teaching left-handers to write correctly are very simple and easy to apply. 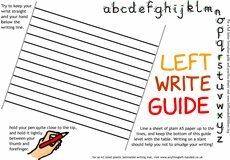 With just a few minutes specific guidance, your left-handed child can be shown a writing method that will enable them to develop a comfortable, neat and efficient writing style that will benefit them their whole life. Aching wrist, smudged work, bad posture and slow writing will no longer be problems. 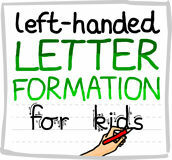 However, this is not the technique that right-handers need to adopt for handwriting, and many teachers are unaware of the subtle yet vital differences in posture, grip and letter formation. As a result, an overwhelming number of our left-handed students are having their specific needs ignored in the classroom, and are developing poor writing and posture as a result. We would like to thank the many thousands of parents and teachers who have visited our websites, shop or various events for the positive feedback and support you have given us. We are delighted that so many children are benefiting from the techniques and teaching aids we now have available. 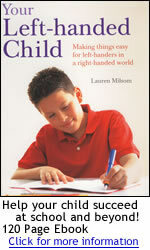 We welcome your feedback, and any new hints or tips you have found to work well for left-handed children. We hope the information we provide here will help you and that you will be able to recommend our site to other parents and teachers. If you need any further guidance please let us know. Our work with teachers and parents is ongoing, and we would be grateful if you would take a few minutes to complete our survey on the support your left-handed children receive in schools.